During 2013 NAMA continued to contribute to the renewal of sustainable activity in the Irish property market through its orderly and phased sale of assets and initiatives to increase transactional activity. In this way NAMA continues to make a direct contribution to reinvigorating the wider economy. In addition to asset and loan sales, NAMA has implemented a number of initiatives, including vendor finance and joint venture opportunities, to encourage increased investor participation in the Irish property market. NAMA is also supporting the market through its development funding programme, which is helping to address a market failure in terms of capital funding availability for viable construction projects, and by acting as a facilitator of transactions that would not otherwise occur, including its work with the IDA to secure foreign direct investment in Ireland. Details of these initiatives are set out below. NAMA's approach is to release assets for sale in the Irish market in a manner which takes account of the market's capacity to absorb them - the NAMA Board's Business Plan of July 2010 refers to a "phased and orderly disposal of assets". NAMA's strategy is aimed at recovering what NAMA believes to be the intrinsic value of the assets that secures its loans. That strategy has been supported by the recent recovery of both the commercial and residential markets in Dublin, a recovery which has enabled NAMA to increase the flow of assets to the market and to achieve strong pricing on recent sales. In particular, a resurgent market in 2013 enabled NAMA to transact sales at significantly better prices than were previously possible. Trends in Irish sales in 2012 and 2013 are shown in Figures B and C. The steady recovery of the Irish economy along with Ireland's exit from the Troika programme has resulted in a notable improvement in investor interest towards Ireland. Consequently, the risk premium which had previously attached to Irish assets has reduced and investors are demonstrating a willingness to reduce their yield expectations in order to secure assets which will produce good returns on a medium- and long-term basis. A key part of NAMA's strategy in Ireland has been to create property portfolios which are attractive to large institutional buyers in the market, including REITs, which tend to favour sizeable transactions. 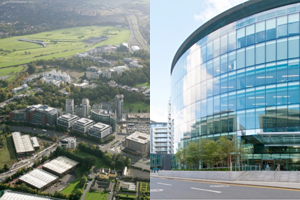 For example, in early 2014, NAMA approved the sale of two substantial asset portfolios: Project Platinum, a portfolio of four Dublin office buildings and Central Park, a portfolio of office and residential assets in South Dublin. These portfolio sales attracted significant levels of interest from potential purchasers – bids with a combined value in excess of €3 billion were received for the two portfolios - and the Agency achieved strong pricing on both. In order to ensure the availability of a steady flow of assets for purchase in the Irish market, the Agency announced plans in February 2014 to bring property portfolios with a minimum value of €250m to the market in each quarter. This will provide investors with certainty around deal-flows, helping to sustain existing investor appetite whilst increasing investment interest in assets outside of the Dublin market. The proposed quarterly portfolio sales will be in addition to the €1.5 billion of property assets which are currently for sale through debtors and Receivers in Ireland and will be in addition also to any loan portfolios that may be offered to the market. NAMA is therefore making a substantial contribution to market activity in Ireland at present. From inception to end-March 2014, NAMA had overseen the sale of €12.4 billion worth of loans, property and other assets held as security across the Agency's total loan book, including the sale of 10,000 individual properties mainly in Ireland and Britain. The bulk of sales, particularly over the period 2010-2012, have been in Britain, mainly in London, as shown in Figures D, E and F. The British market, in contrast with the Irish market, quickly recovered its buoyancy after the 2008-2009 downturn and, in general, prices have increased relative to NAMA acquisition prices which were determined by reference to a November 2009 valuation date. The ongoing resilience and liquidity of the British market presented an opportunity for debtors and Receivers to dispose of properties which were ready for sale and for which there was demand. To end-2013, over €8 billion of British assets had been sold, including €6.4 billion in London. NAMA continues to have significant exposure to properties in London, particularly residential development. Up to 2013, the most attractive assets to buyers have been offices, hotels and residential units, particularly in Britain. However, as reflected in Figure B, interest in other sectors, including residential and development land, is increasing as the recovery in the Irish market in particular matures. Loan sales account for an increasing proportion of NAMA disposals in Ireland, reflecting increased investor interest in larger transaction sizes and the maturing of Europe's loan sales market. In 2012, loan sales accounted for 6% of total Irish disposals. In 2013, this figure had increased to 24%. Sales to date have included individual loans and debtor connection loan portfolios in Britain and Ireland. Loan portfolios are offered for sale to the market in cases where there is evidence of strong investor interest and where NAMA is satisfied that the resulting proceeds would not represent a discount on the proceeds that would be realised from the sale of the underlying secured properties. Loan sales are conducted in line with accepted international best practice and NAMA's policy is that, other than in exceptional circumstances, loans are openly marketed. Sales are conducted by firms selected from two panels of loan sale advisors which were established after a public procurement process in 2012 – one for loan sales in the US and one for loan sales in Europe, including Ireland and Britain. To end-2013, across the entire NAMA portfolio, NAMA had completed sales of loans with nominal balances of €3.9 billion and this had reached €4.8 billion by end-March 2014. At that stage, there were a number of large loan portfolios on the market and planning was well advanced in respect of a number of other loan portfolios which are expected to come to the market later in 2014. Project Aspen - a €800m par debt portfolio secured entirely on Irish commercial property was sold to a major US investment group in the first half of 2013 and represented the sale of NAMA's first major Irish loan portfolio. 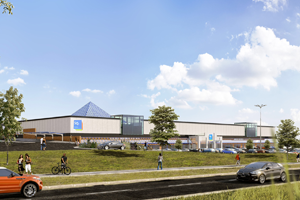 Project Club - a €250m par debt portfolio secured mainly by Irish shopping centres completed in 2014. Project Holly - a €373m par debt portfolio secured by offices, hotels and land in Dublin and Meath completed in February 2014. Project Eagle – in April 2014, NAMA announced the sale, subject to contract, of the Project Eagle portfolio of loans to affiliates of Cerberus Capital Management, L. P. The portfolio consists of loans owned by Northern Ireland-based debtors and secured by assets in Northern Ireland, the Republic, Britain and other European locations. The portfolio has a par value of £4.6 billion and its sale would represent the largest single transaction by NAMA to date. In 2012, NAMA announced plans to advance vendor finance over the years 2012 to 2016 to purchasers of commercial property securing its loans, mainly in Ireland. Vendor finance is provided to new investors for periods typically ranging from three to five years, with the expectation that it will be refinanced by the banking sector when more normal market conditions return. The first vendor finance transaction, involving the sale of an office building, One Warrington Place in Dublin, was completed in April 2012. NAMA has since concluded a number of other transactions including Edward Square Shopping Centre in Galway, Croydon Hotel in London and Project Aspen. NAMA has advanced €373m to date and has indicated its willingness to provide up to €2 billion in total to facilitate investment in Irish commercial property if required. Vendor finance was introduced in 2012 at a time when many potential investors were constrained by a lack of access to bank finance. A number of developments during 2013 suggest that the need for vendor financing may be reducing. These include the prevalence of international investors with ready access to capital, a gradual increase in domestic bank lending and the introduction of Irish REITs as an alternative investment mechanism. 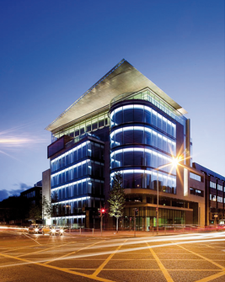 In April 2012 NAMA completed its first vendor finance transaction - the sale of an office building, One Warrington Place in Dublin. NAMA launched its 80/20 Deferred Payment Initiative ('DPI') in May 2012. The initiative aimed to provide home buyers with a level of protection against a fall in residential property prices over the initial five years of a mortgage. The initiative was launched in conjunction with BOI, EBS and Permanent TSB and extended to over 400 residential properties in Ireland under the control of NAMA debtors or Receivers. Under the initiative, the home buyer paid 80% of the property price upfront, with the residual amount (up to 20% of the property's value) payable in five years by the mortgage provider (on behalf of the home buyer) directly to NAMA, depending on the value of the property at that time. The residential properties included in the initiative were released on a phased basis from May 2012 to June 2013. 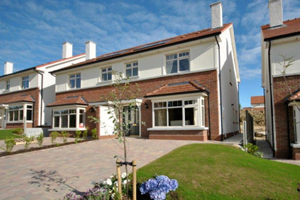 The properties, predominantly three and four bedroom semi-detached houses, were located in 33 developments across 13 counties. In January 2014, NAMA announced that the DPI would be closed to new entrants with effect from 31 May 2014. This decision was made on the basis that the initiative had achieved its objective of generating sales activity and facilitating greater price discovery, with feedback from purchasers indicating that fear of falling house prices was no longer a significant factor. In total, 64% of the properties included in the initiative since its inception have been sold. By end-March 2014, this included the sale of 264 properties with a total sales value of €52.21m. Of those transactions, approximately 40% of the purchasers had availed of the initiative through one of the participating mortgage providers. NAMA is committed to delivering significant investment in the Irish economy through its development funding programme. It has approved over €1 billion in development funding for the completion of construction projects currently in progress in Ireland and to develop new projects to meet prospective supply shortages in certain sectors. Over €600m of this has been drawn down for a range of Irish residential, commercial, retail and leisure projects. Examples of the funding are included on the following pages. NAMA expects to approve total development funding of €2.5 billion for commercially viable projects in Ireland over the period to end-2016. This will include the construction of 4,500 new houses and apartments in Dublin in addition to office accommodation in Dublin and investment in viable retail projects. It will include significant development in the Dublin Docklands and in other urban centres in response to the emerging growth needs of the economy. 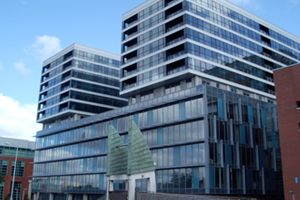 NAMA provided €65m in advances for the completion and fit-out of this Grade A office development in Dublin's Docklands. The property is now complete and has secured a number of major lettings. Lanyon Plaza and the Soloist are adjoining office buildings in central Belfast comprising a combined space of over 180,000 sq. ft. NAMA provided over £15m in funding to fit-out the buildings and significant lease arrangements in both properties have now been agreed. Leases include the Northern Ireland Department of Finance and Personnel's rental of the 90,000 sq. ft. of office space at Lanyon Plaza and a leading law firm's agreement to rent five floors in the Soloist. 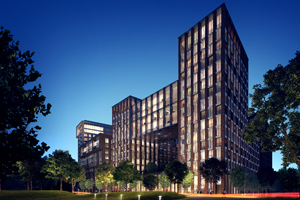 NAMA provided over €14m in development funding for the completion of Block G in Central Park, a mixed-use development on a 20-acre site in Sandyford, Dublin. The completed property consists of a multi-let 8 storey building which now provides over 190,000 sq. ft. of Grade A office space. The sale of the Central Park development, as part of Project Platinum, was finalised in early 2014 after a very competitive bidding process. NAMA approved €18.5m in funding for the development of a mixed-use town centre in Oranmore, Co. Galway which was pre-let to a major multinational retailer. A further 18,000 sq. ft. of the available retail space, for which NAMA approved €2.5m in funding to construct, has been subsequently pre-let to another major international retailer. 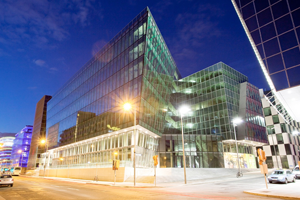 Image of the exterior of 4 Grand Canal Square, the completion of which was funded by NAMA. Image of the exterior of Lanyon Plaza, Belfast the fit-out of which was funded by NAMA. 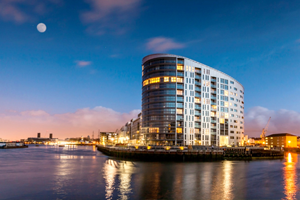 NAMA is providing €27m in investment funding for fit-out at the Point Village in the east of the Dublin Dockland's SDZ. The property comprises 985,000 sq. ft. of mixed-use space including office, hotel and retail units. The global IT company Yahoo! recently agreed a lease on over 70,000 sq. ft. of office space in the Point Village. 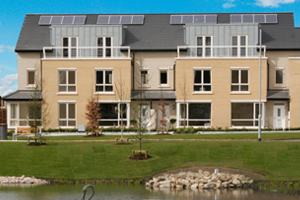 Honeypark is a residential development in Dun Laoghaire, Co. Dublin. NAMA advanced €43m in development capital for the completion of Phase I and Phase II of the project. Once complete, Honeypark will incorporate over 1,800 houses and apartments. Plans also include 17,000 sq. ft. of commercial space, including a crèche. Phase I is complete and Phase II is expected to complete in 2014. NAMA has provided nearly €11m in development funding for the construction of Forest Hill, a new high-quality residential development in Carrigaline, Co. Cork which, on completion, will contribute over 400 new houses. 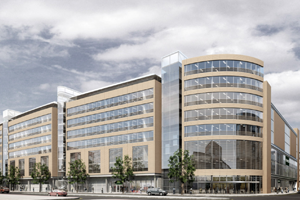 NAMA is providing investment funding for the fit-out of the Point Village, Dublin. NAMA has advanced development capital for the completion of Phase I and Phase II of the Honeypark development in Dublin. NAMA has provided development funding for the construction of Forest Hill in Cork. In addition, NAMA has driven a strategy to create a deliverable development opportunity through the extension of the existing Centre and (a) has agreed terms with South Dublin County Council to acquire the 16-acre site surrounding the Square and (b) funded the preparation and lodgement of planning application for 200,000 sq. ft. of a retail extension. A decision to grant permission was made by South Dublin County Council in March 2014. NAMA has actively supported a value-enhancing strategy to rejuvenate the Square as the economic hub and town centre for Tallaght. Asset sales in Britain have been conducted in line with NAMA's policy of a phased and orderly programme of disposals and the requirement that NAMA would generate sufficient cashflows to meet its milestone, which was adopted by the Troika, of repaying €7.5 billion of its Senior Bonds by end-2013 – a milestone that was successfully met. By reference to this policy, property sales by debtors and Receivers have been heavily influenced by liquidity conditions in various markets and by the attractiveness of various asset classes to investors. Approximately 75% of sales had been in Britain to end-2013, particularly in London, where prices have increased substantially since 2009. With London seen as a safe haven for investors, strong demand meant that assets could be sold at very attractive yields, often in the 3% to 5% range. NAMA has sought to strike the appropriate balance between a requirement to make significant progress in selling assets and redeeming its debt and the imperative to do this in a way that optimises the sales proceeds of those assets, having regard to the liquidity and prices that are available in various markets. In a number of cases, NAMA identified assets where it was apparent that, by injection of funding, significantly greater returns could be obtained. Examples include a number of major residential development programmes in London where, through NAMA's capital investment, the return to Irish taxpayers has been significantly enhanced relative to the return that would have been obtained by selling undeveloped sites. 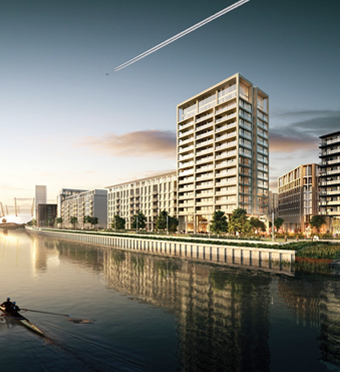 A computer generated image ('CGI') impression of Royal Wharf, a development site in London, the sale of which was completed in Dec 2013. New Capital Quay is a development project of over 1,000 apartments located in Greenwich on the banks of the River Thames. The scheme comprises 10 buildings which are primarily residential along with retail, commercial and community uses. Construction commenced in March 2011 and is due to be completed in early 2015. The financing of this development was successfully de-risked through advance sales of private and affordable residential units as well as a supermarket unit. 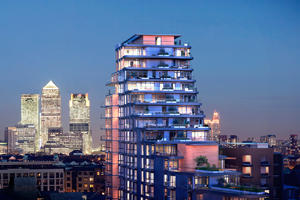 NAMA approved £97.2m of funding for the development of Phase I and Phase II at 21 Wapping Lane which is situated in one of the longest established prime east London residential markets. The scheme comprises five buildings including a multi-storey residential tower together with buildings for retail, commercial and community uses. Phase I of the development is complete and funding was repaid in full in Q1 2013. Construction began on Phase II in July 2012 and is expected to complete in 2014. The financing of this profitable development successfully enhanced the loan repayment capacity of the debtor. Embassy Gardens is a development site located in Nine Elms and is planned around the proposed new US Embassy which is expected to complete in 2017. NAMA approved £135m to fund the development of Phase I which comprises private and affordable residential units together with retail and commercial space. Construction commenced in November 2012 and is due to complete by end-2015. The financing of this phase was successfully de-risked through advance sales and all private and affordable residential units have sold. NAMA provided over £11m in funding for this development. The planning system is an important focus for NAMA as many of the Agency's investment plans are predicated on the resolution of various planning and infrastructural issues. 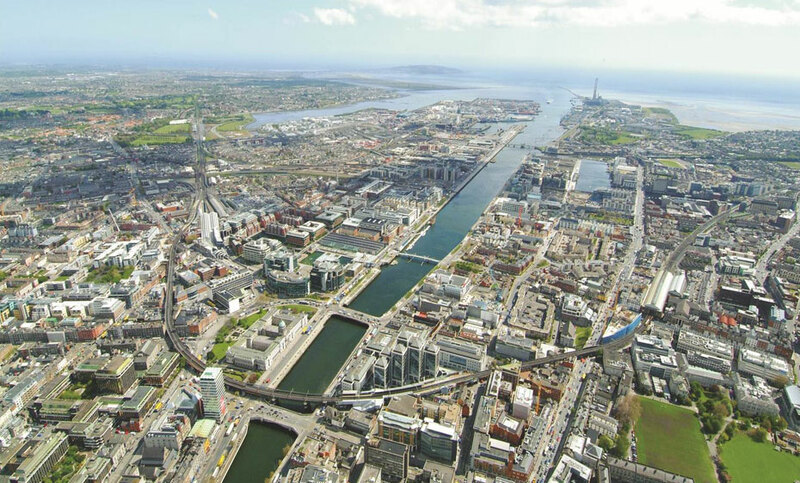 For example, the planned investment in the Dublin Docklands is dependent on the adoption of a workable SDZ planning scheme and clarity on the provision of infrastructure. More generally, a number of critical projects within the NAMA portfolio currently have no planning permission or have permissions that are no longer viable. For example, while there is extant planning permission on NAMA-secured sites in south Co. Dublin for 1,500 residential units, it is estimated that, for planning, infrastructure or economic considerations, just over 200 of these properties are currently deliverable. NAMA is working closely with local authorities in Dublin and in the other main urban centres to identify ways to overcome barriers to development, including planning and funding. NAMA has also contributed at a national level, through engagement with the Department of the Taoiseach and the DECLG, to policy discussions aimed at achieving efficiencies in the planning process. A more efficient planning process would mean greater certainty for projects, for investment and for employment and for meeting current and future demand for housing and offices. For the most part, NAMA capital expenditure is channelled to projects through funding provided to debtors or Receivers. However, in certain circumstances, NAMA may seek to partner through joint venture arrangements with domestic or international counterparties to develop NAMA-secured sites. To date, the Agency has entered into joint ventures to develop three strategic sites in the Dublin Docklands, on City Quay, Hanover Quay and the U2 Watchtower site. To facilitate more of these arrangements, which are intended primarily to increase the long-term recoverable value of assets, NAMA recently sought expressions of interest from credible counterparties to co-invest with it to develop potential joint venture opportunities in Ireland. At end- March 2014, a month after it first invited submissions, 121 parties had expressed interest in forming joint ventures with the Agency. The Agency has welcomed the very strong level of interest from both Irish and international firms involved in construction, investment and asset management.  More than half of all expressions of interest received were from firms based in Britain, Europe and the US. 70% (a total of 82 firms) have expressed interest in partnering with NAMA in respect of joint venture opportunities that may arise in Ireland. Parties expressed strong interest in a broad range of project sizes in Ireland. In respect of Ireland, 52 firms expressed interest in projects with a value of more than €100m. 69 said they could partner in projects with a value of between €50m and €100m, while 75 are interested in projects of between €20m and €50m. NAMA has said that should it identify potential joint venture investment opportunities, it will review the submissions received for suitable investment partners and seek information from selected interested parties on a case-by-case basis. *Note: A number of parties indicated their interest in investing across a number of lot sizes. In addition to funding delivered through NAMA's Asset Recovery division, NAMA's Asset Management division is focusing on the development of a number of large-scale projects in markets where NAMA has material exposure and where demand for completed or new buildings justifies a project-focused effort. A particular focus in this regard is the Dublin Docklands. In December 2012, the Government announced the designation of some 66 hectares of land in Dublin Docklands as a SDZ. Such zones are designated to facilitate development which is of economic or social importance to the State. To enable this, the SDZ legislation allows for a fast track planning regime. Once a SDZ plan is adopted by An Bord Pleanála on appeal future planning applications which are consistent with it must be granted permission and no appeal can be taken against such a grant of permission. In the case of Dublin Docklands, the Government has confirmed that the SDZ, reflecting the potential and need for comprehensive planning and development in this area, will ensure the efficient use of public investment in infrastructure and will also enable the delivery of policies for this area, as made by Dublin City Council. Within the SDZ area, about 22 hectares are currently undeveloped. NAMA holds security over a significant portion of these lands and has direct ownership of a small number of sites. These lands are a key focus for future viable investment by NAMA. Dublin City Council, as the appointed Development Agency, prepared a Draft SDZ Scheme in 2013, with two public consultation periods. NAMA made formal submissions to the City Council during both periods and expressed strong support for the principles of the emerging SDZ Scheme. Dublin City Council adopted the SDZ Scheme in November 2013 and it is currently before An Bord Pleanála. An Oral Hearing was held in February 2014 and in the course of its submissions to the City Council and to An Bord Pleanála, NAMA offered suggestions on issues such as land use mix, infrastructure provision and the importance of a pro-active Development Agency to deliver on the SDZ scheme once adopted. It is hoped the SDZ will receive final approval in mid-2014. The overall SDZ area covers 66 hectares. NAMA has an interest in over 70% of the 22 hectares available for development.